Directed by Antoine Fuqua. Produced by Roger Birnbaum and Todd Black. Written by Nic Pizzolatto and Richard Wenk. Release date: September 23, 2016. The latest unnecessary remake coming out of Hollywood is The Magnificent Seven. It's based on the 1960 film, which itself was already a remake of Seven Samurai, which came out of Japan. The basic idea here is that seven individuals come together in order to protect a small town from bandits. Then there's a big battle in the town. It's so incredibly simple, and even if you haven't seen either of the earlier films, you've probably seen something that borrowed heavily from them. The new film takes place in the 1870s and is set in Rose Creek, a small town that it about to be taken over by Bartholomew Bogue (Peter Sarsgaard), because he wants the land and the local mine, basically. His idea of capitalism and democracy is "take what you want," so you know you're in for a really interesting, complex villain. He kills one of the townsfolk to make a point, so his widow, Emma Cullen (Haley Bennett), goes out in search of people to defend her town. She finds Sam Chisolm (Denzel Washington), who tracks down fugitives but claims he's not a bounty hunter, and convinces him to save the town and find an army. The rest of the "magnificent" seven: Josh Farraday (Chris Pratt), a drinker and gambler; Goodnight Robicheaux (Ethan Hawke), a rifleman; Billy Rocks (Byung-hun Lee), who has a fondness for throwing knives; Vasquez (Manuel Garcia-Rulfo), an outlaw whom Chisolm convinces to join in return for letting him free afterward; Red Harvest (Martin Sensmeier), a Comanche warrior; and Jack Horne (Vincent D'Onofrio), a tracker. 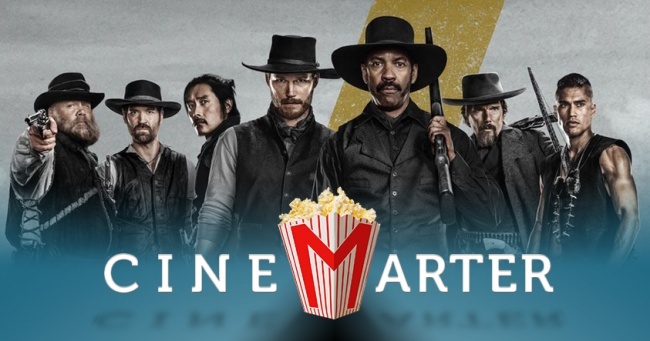 You might notice that this is a racially diverse - statistically improbably so - and that's one of the only reasons that The Magnificent Seven is even noteworthy. Our movie goes through a few stages: recruitment, travel, preparation, battle. None of these points are particularly boring, which is one thing that the film has going for it. Despite being over 130 minutes long - slightly longer than the original remake, far shorter than the Japanese original - it doesn't feel overlong. It moves at a good pace, keeps things constantly engaging, and switches up what it's doing often enough to keep us from being bored. It could've been far worse. The Magnificent Seven is the type of movie you watch to get through a couple of rainy hours on a weekend. Of course, that doesn't mean that it's a particularly good movie or one that's worth seeing, but if you do find yourself stuck with it, you're not likely going to hate the experience. The action is only passable - it's a lot of same-y gunfights, mostly - there's little to the characters, the plot is, by its nature, unoriginal, and there's almost nothing to stimulate your brain. It's a breezy and jokey experience - its tone is very "cowboy Avengers," if you will - which helps pass the time, but does it offer anything fresh? Not really, no. That's part of the problem with these remakes in the first place, isn't it? You don't just want to make the same movie again or make a compound of various films that have come out since the original. Ideally, you want to have a hook or unique spin in order to differentiate your new movie from the original. I understand "transplant remakes," for example, like the original Magnificent Seven, as they take place in an entirely different location and with a contrasting cultural backdrop. This new film? Beyond its diverse cast, which doesn't actually mean much inside the film - a missed opportunity to speak on racial tensions of the time - it doesn't bring much to the table. But, hey, you want to watch a few name actors have fun laughing and shooting up a Western? Well, you could do worse than The Magnificent Seven remake, I guess. I mean, I'm still trying to figure out exactly what Vincent D'Onofrio was doing here, but it isn't ever not at least moderately enjoyable. Denzel Washington brings the gravitas, Chris Pratt delivers the jokes (and magic tricks), Ethan Hawke has a whole PTSD thing going on, Byung-hun Lee gets to throw lots of knives, and ... what more do you really want? The final battle throws explosives and a Gatling gun into the mix, because Hollywood, and while the bloodshed becomes repetitive and all the dead bodies fail to leave an impact, it still passes the time. The Magnificent Seven is the type of movie you watch to get through a couple of rainy hours on a weekend. Does it deliver anything that will make you remember it even a couple of hours later? Not really, except for a racially diverse cast. 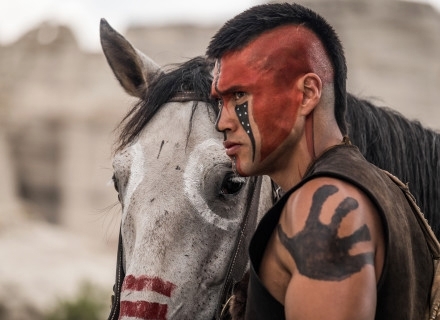 I mean, an actual Native American is playing the role of a Native American, which is noteworthy - even though it shouldn't be. But beyond that? It's an unnecessary but not altogether unenjoyable re-remake that isn't really ever boring, even if it's also only intermittently entertaining. It's well-paced and varied enough to pass the time, but if you're hoping for anything more you're going to be disappointed. Bottom Line: Passable but little more, The Magnificent Seven is another unnecessary remake. Recommendation: A rainy afternoon cable viewing will be the best way to absorb this movie, assuming you wouldn't rather just watch the original or Seven Samurai (the original-original).